Aaron Swartz & Bradley Manning: Are free information icons a good thing? On Saturday in New York City, one could have been fooled into thinking that the city was in full bloom, though we’re still in the last long breaths of winter. As I strolled through Brooklyn with a friend, we relished the sunbeams beating down on our faces. We stopped a few times to direct our heads toward the sun and close our eyes. Those moments were beautiful. 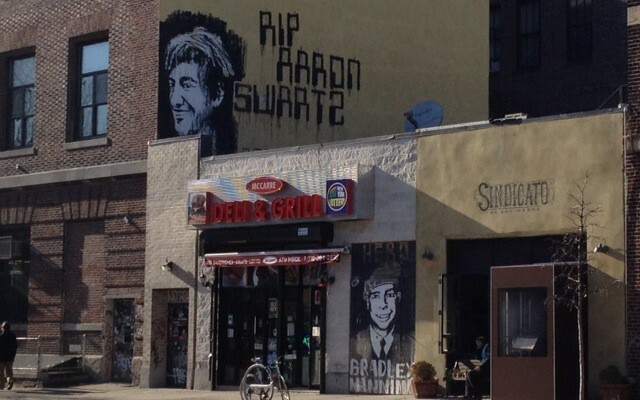 And then we rounded a corner and came across a newly painted street art portrait of Aaron Swartz, and I was brought back to political reality. The artwork is located on a building next door to a shop on which a Bradley Manning portrait was painted shortly after his detention a couple years back. The spell of spring was broken for me. With Swartz’s death and Manning’s sysiphean effort to regain his freedom, it’s been something of a winter of discontent—at least in the world of free information. It would be an understatement to say that the media and internet users have made symbols of Swartz and Manning. I must admit, I’ve had my fair share of engagement in this process. But since January Swartz’s life has undergone something more: martyrdom. In viewing Swartz and Manning nearly side by side on those building walls, the martyrdom became complete, to my mind. It was the iconization of free information rebels. A cult of personality is clearly visible. We’ve seen cults of personality before: Che Guevara on the walls of Cuba and elsewhere. Subcomandante Marcos in Chiapas, Mexico and beyond. And, more recently, Anonymous’s Guy Fawkes image, which is unique in that it doesn’t simply exist statically on some wall, but bursts into three dimensions in the form of masks. This technique isn’t limited to Anonymous. I recall a Manning and Julian Assange masks being worn at some protests in 2011. I’m sure we won’t have to wait too long for a Swartz mask, if there haven’t been some already. Which has me thinking about this iconization process in general. Is it necessarily a good thing for the free information effort? I’m not so sure. I do admit that icons and martyrs have a way of catalyzing change, and in that way they can be useful for greater social efforts. And so in that respect the iconization of Manning and Swartz is useful. But I also think it serves to reduce the lives these two men lived outside of activism, and reduces the free information effort to a few leading lights; when in fact the effort is much bigger than them. It seems to me that Swartz would be rather embarrassed or even disheartened to learn that he’d become a symbol, a tool. Manning is likely too busy mounting a defense to dwell much on his icon status, but I suspect he probably has felt similar sentiments. He noted in a recent courtroom statement that he wanted to start a debate about the US’s international relations. He reminded us all that it was never about him, but about making democracy actually function. In a country of 300 million people—granted, many of whom are not of voting age—is it not a little absurd that we wait for a Bradley Manning, Julian Assange, Aaron Swartz, or a small band of Anonymous activists, to “liberate” information? Shouldn’t we all be making similar demands on a consistent basis, and use whatever skills we have to do so? Not to reduce the efforts of Swartz and Manning or any other free information activist, but I now realize that it will take far more than their brave efforts to see this thing through to the end—if, in fact, there is an end. It took street art for me to see the clear reality. Part of this came about in a series of interviews I did for a Makeshift magazine article entitled “Open the World.” In researching the various non-hacking methods of liberating information, I saw that it wasn’t just about taking information from an unwilling government, but about making enough noise with a critical mass to get information in the first place. We cannot wait for the next Bradley Manning or Aaron Swartz to arise. All of us have that sort of potential. We may not have Swartz’s galvanizing creative genius and social activist zeal, or Manning’s access to military intelligence, but many millions of us share their passion. The difference is that Swartz and Manning took action, while the majority of us are content to watch TV, surf the internet and take 40 photos of ourselves daily, and leave the functions of democracy to the political classes. This is, to borrow Captain Hook’s phrase, bad form. If the iconization of Aaron Swartz and Bradley Manning, or even Julian Assange, can teach us anything, it is that we are embarrassingly inactive and apathetic as a whole. So where does this leave us? Read the rest of the op-ed over at Death and Taxes. Editor and Writer — bylines at VICE, Motherboard, Fast Company, The Creators Project, The Quietus, The Verge.